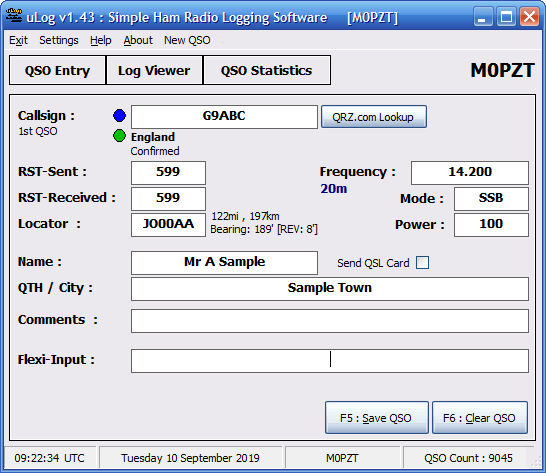 uLog (pronounced micro-log or, if you prefer, “you log”) has been designed as an easy-to-use logbook application that offers just the basic fields for QSO entry. No fancy gimmicks, just quick and easy input of QSOs whether you’re in the Shack or somewhere /P with a netbook/laptop. The emphasis is on quick and simple logging without multiple windows, macros or lots of settings. uLog is perfect for club stations that wish to get inexperienced operators on the air and logging without fuss. You’ll be pleased to know that uLog and PZTLog both use the same logbook format so you can run both if you wish – If you like uLog and wish to upgrade to free PZTLog for more features, you can do so and keep your existing QSO data. The uLog window is resizable allowing you to increase the size of not only the window, but the fonts/textboxes as well – Useful if you didn’t like the previous “fixed” window format! QSOs can be entered “live” as you make the QSO or typing-up later on (perhaps from a paper-log). When entering a QSO, you can tab-through each field as you receive the information, or you can use the single Flexi-Input textbox – Just type the value and press enter and it’ll be moved to the correct field automatically. 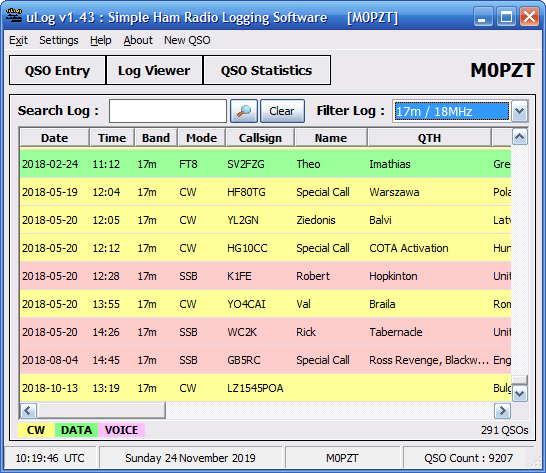 A Log Viewer tab offers the last 25 or 50 QSOs along with search/sort features plus a coloured display showing CW, Voice and Data Mode QSOs in different colours. The main window can be re-sized to suit your operating preferences which makes it ideal as a basic “club” logging solution for those a bit timid of complicated programs or just those new to the hobby. PZTLog Compatibility : The logbook uses the same format although does not support all of the database fields (eg: CQ/ITU-Zone, IOTA, WAB, Contests). Should you require a more advanced logging solution (along with integrated PSK/RTTY digimodes) such as PZTLog you can use your existing Log file and carry on logging. Please note that this is a Windows application and I work exclusively in Microsoft Windows – If you’re running Linux or a Mac, I can’t help you. The software works best when installed to C:\uLog … Some of my programs have their main EXE file compressed which can cause some enthusiastic virus scanners to complain. This contains the latest program EXE, Help file and Callsign/DXCC Databases – you MUST have an existing installation of uLog to use these files.